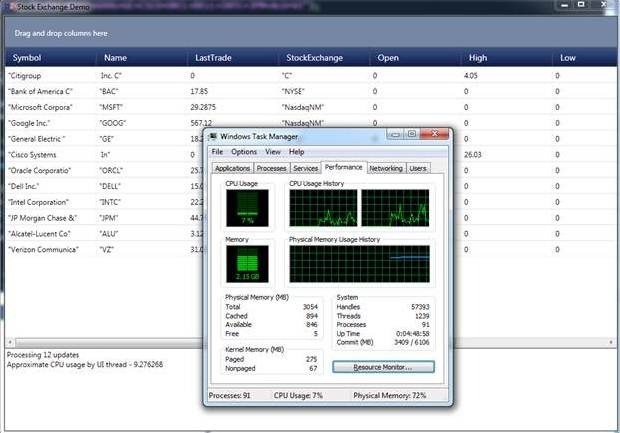 Microsoft StreamInsight CEP is a very powerful platform for developing complex event processing (CEP) systems. There are several development models that we can follow. In this post we will use the IObservable/IObserver model using .NET Reactive extensions (Rx). Since this will be a real-time application, we will also be using F# async workflows to pull stock data. F# async workflows are the coolest part of using F# in a real-time application. They allow writing concise code that (1) executes in parallel and (2) exposes to another .NET library with ease. We have used  attributes to mark these events for exposing to other .NET CLI languages. Since we are using Rx, we need to have an event that inherits from System.EventArgs–JobCompletedEventArgs does that here. The AsyncWorker is now ready to be used as a library for running parallel code. The Stock Quotes Reader defines a wrapper that performs a request to the server (it would be Yahoo finance here) and pulls the stocks. It has an async block code that returns a line of data based on the response stream. PullStocks will create async requests and raise the StockAvailable event whenever the async job is completed. 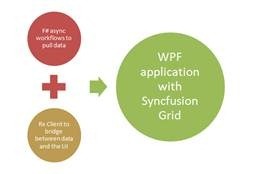 · Syncfusion WPF GridDataControl – works well with high-speed data changes, keeping CPU usage to a minimum. · Rx – creates requests and updates the ViewModel bound to the grid. The WPF application uses a simple MV-VM by defining a StocksViewModel to hold stock data. The Stocks collection is bound to the Syncfusion WPF GridDataControl. This real-time application requires real-time data that will be pulled over the wire for every 500 milliseconds. We will be making use of IObservable to create a streaming request and repeat that over a time delay. We now have streaming real-time stock data pulled asynchronously over the Web and shown on the Syncfusion GridDataControl. This also works with Essential Grid Silverlight in out-of-browser (OOB) mode. If you want to get hold of the sample, send me a request.